The FIFA 19 EAS FC Catalogue houses hundreds of different in-game unlockable items that help improve your FIFA experience. Find out in this guide, how it works and how you can take advantage of the FIFA 19 EAS FC Catalogue. The EAS FC Catalogue is a kind of store where you can trade the FCC (Football Club Credits) earned for hundreds of items. It tracks progress through the game by awarding you with XP and Football Club Credits, which allow you to redeem hundreds of in-game unlockable items to enhance your FIFA experience. Your EA Sports Football Club Level determines which ones are available for you to redeem. As a Level 10 gamer, you’ll only have access to items categorised from Level 1 to 10. So, the more you play and level up, the more it will give you access to new unlockable items. Use the FCC you’ve earned through your play to redeem the items for use. Items include things like goal celebrations, historic kits, extra matches in Seasons and coin boosts in Ultimate Team. The EAS FC Catalogue was initially created for FIFA 13 Ultimate Team. It was the way that EA found to reward you by your FIFA time play. Until there, your progression could be tracked by your level XP but it was useless. With the addition of EAS FC Catalogue, you have more reasons to play the game because your efforts are rewarded with unlockable items. In FIFA 14 the biggest addition to the EAS FC Catalogue was the feature that allows you to send gifts to friends. But things did not go well. EA Sports have disabled the most popular and most wanted item of the EAS FC catalogue, the FUT Coin Reward Boosts, because thousands of players have exploited a glitch that allows them to earn much more coins than it was supposed to give. The item was unavailable for five months, between October 2013 and February 2014. In FIFA 15 the coin boost were back again but without the feature to send gifts. The biggest addition was probably the loan players item that gives you the chance to try top players in your Ultimate Team squad. In FIFA 17, EA removed the EAS FC features, including alerts and messages to your friends, excepting the catalogue which is still available. 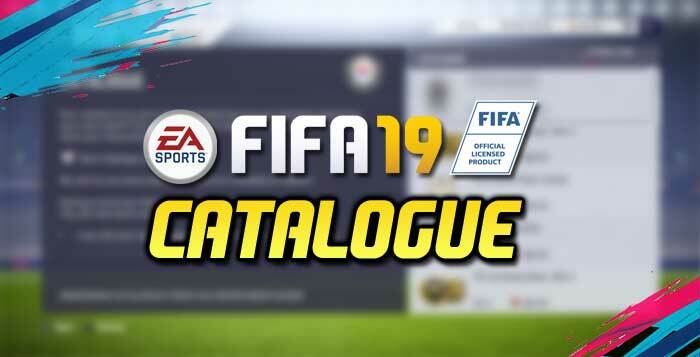 How to use the FIFA 19 EAS FC Catalogue? As we have said, you need two things to redeem items from the FIFA 19 EAS FC Catalogue: EAS FC Level and FC Credits. No matter what game mode you’re in, there are numerous things you can do to be automatically awarded XP (Experience Points). Once you complete one of these events you’ll be notified that you’ve earned XP via an in-game pop-up. Your XP total will be seen in the EA Sports Football Club widget in the corner of most screens. Each time you reach a certain XP threshold, showcased in a meter that fills up, you’ll reach a new level. FCC is the abbreviation of Football Club Credits, the EA Sports Football Club currency. Don’t confuse with Ultimate Team coins. In the exact same way you earn XP, you’ll earn FCC. Your FCC total can be seen in the EAS FC widget in the corner of most screens. You can use your FCC to redeem unlockable items that can enhance your FIFA experience in the FIFA 19 EAS FC Catalogue. You may earn XP and FCC in FUT 19 playing matches, winning tournaments, completing the story mode campaign, getting promoted or levelling up your EAS FC level. Outside Ultimate Team mode, you may also earn XP and FCC getting promoted in seasons head to head or in Co-Op and winning awards or cups in career. You can access the FIFA 19 EAS FC catalogue wherever you are. You don’t have to back out of the mode you’re in because it is always available through the EA Sports Football Club widget. To access the catalogue, click on ‘Catalogue’ in ‘Customise’ menu or press the Right Stick and then go all to the right until you see the shopping cart icon. The EAS FC catalogue is optimised to show you first the items of the game mode you are in. Inside the FIFA 19 EAS FC Catalogue, the items are organised by level of experience and by game mode. It is possible, for example, to filter the items that are exclusively for Ultimate Team mode. You can not redeem items of a higher level of yours and you are not allowed to buy an item more than once. The purchased items are marked with a green tick and the inactive items are marked in grey until you reach the respective level. The EAS FC catalogue is only available in the console. You can not access it through the Web App or mobile devices. You will not find it in FIFA for Android or for iOS, but your progress in the game will contribute to your level XP and FC credits. You can use them to redeem items on your console. To offer an item can be very advantageous because it only costs half the price you pay when you redeem that item for yourself. Ask a friend to offer you the items you want and do the same to him. Both will save. It is very simple to send a gift. You just need to go to the FIFA 19 EAS FC catalogue, find it and select the option ‘send a gift’ which is right beside the ‘redeem’ option. It will pop a list of your friends and you just need to choose who you want to send the gift to finish the process. You can only offer items to friends that play on the same console you do. For example, it is not possible to send a gift to a Playstation 3 owner if you play in Playstation 4. You can only redeem an item to yourself once. However, you can send it as a gift as many times as you wish, even if you already have it. It is possible to offer an item that you already have redeemed to yourself. In the same way, you can only accept gifts if you do not have them yet. As we have already explained, there are items for several game modes on the EASFC Catalogue. The items you can use on Ultimate Team mode are well explained in this our other guide. It’s time to list the items for Career Mode, Online and Gameplay. To level up your FIFA 19 Account, you need to grow up the FIFA 19 XP Level, which are experience points that a player earns through performing various activities. With levelling up and continuously performing normal FIFA 19 tasks, you earn more and more FC credits. There are many ways you can to gain XP and FFC, but below we list the ten most effective ways to help you collect FIFA 19 XP and Football Club Credits fast. Use the same account to play FIFA Mobile. You can play easy and quick games that take less than a minute to complete such as penalty shootouts. Switch the difficulty to World Class for maximum XP. Complete the FIFA 19 achievements, especially the repeatable achievements like performing 15 corners, spot kick hero or 15 decisive wins. Buy players from you favourite club. You only need to change your favourite club to any lower-tier squad in Profile Manager and buy one of their cheap players. Buy IF cards for their lowest price range and sell them for the same price plus taxes. Enter in FIFA 19 several times a day. What has changed on the EAS FC Catalogue? Q: How can I access to the FIFA 19 EAS FC Catalogue? A: From the EAS FC widget (R3 on Playstation / RS on XBox One) or from the ‘Customise’ menu. Q: Which items can I buy? A: You can buy all the items for which you have enough credits and which are not marked in gray. The items of a higher level than yours are not available for you until you reach these levels. Q: Is there a limited number of times you can buy an item? A: Yes. You can only buy each item once, except to offer to your friends. Q: I already used the FUT Change Club Name item but I want to change it again. What can I do? A: Nothing. If you already used in Managers Tasks, then there is no other time. Q: How many FUT coins reward boost can I use? Do they accumulate? A: You can and you should use all the FUT coins bonus that your level allows you. However, only one bonus will be active at a time. You can buy them all at once and every time an item expires the following one turns active. Q: Will my FC Credits and XP level get transferred from FIFA 17 to FIFA 19? Q: How can I send a gift to a friend? A: Simply select the item in the Catalogue, choose to redeem it, and you’ll be given an option to gift it to a friend. It only costs 50% of the regular price to send a gift and you can gift an item to a friend that hasn’t reached the level that the item is from. Q: Why I can’t offer ‘Coin Boost’ items? A: Because it is not possible. That’s the only item that you are not allowed to send as a gift. Q: I redeem an item but nothing happens. What should I do? A: Contact the EA Support. Q: If I send a gift to a friend, will I be able to redeem it to myself? A: Yes! You can gift the item to as many people as you want, and still be able to redeem it to yourself. Q: How can I improve my XP level faster? A: Check the top ten tips we published on this page. Q: Is there any limit to the XP I can win? A: Yes. There is a 2000 XP daily limit. I agree with Mr. Dan Green. There’s a lot of adidas new boots but where’s Nike? This is common issue in all past Fifa games. Please consider our request.